A few days back, I had the opportunity of going to the Pita Pit Lounge located in M-Block Market, Greater Kailash – 1, and attending their Pita Making Session. This outlet is not only the largest in the National Capital Region, but also serves as the employee training centre as well as the chain’s flagship store in the city of Delhi. Pita Pit has two other branches, one located in DLF Cyber Hub, Gurgaon, and the other in Select Citywalk, Saket. I was welcomed to the restaurant by Mr. Anun Dhawan, who along with his family handles the franchise for the north and east zones of the country. He also told me about the history of Pita Pit, and that he was introduced to the brand by his brother Ishaan, who came across Pita Pit while specializing in food and beverages in Canada, and incidentally, also handles Royal China in Nehru Place. Now with three stores already up and running quite well, Mr. Dhawan plans to expand further, with five to six new stores by the end of the year, hopefully in Connaught Place and Rajouri Garden, and fifty more outlets on a national scale in another five years. Pita Pit is a recently established chain of quick serving restaurants, first started by John Sotiriadis and Nelson Lang in 1995, in the Canadian university town of Kingston. The basic aim of the founders was to provide an alternative to high carb and high fat containing snacks and food items. A fusion of Lebanese, European, and American cuisines, Pita Pit essentially offers a global range of food on its menu which can be further customized by its clients according to their personal preferences. The first outlet proved a hit, attracting a huge student population from the local Queen’s University, and has since then spread its branches across the world, with over five hundred stores in different countries such as the United States, France, Canada, New Zealand, Trinidad and Tobago, Australia, Panama, South Korea, and many others. As a company, Pita Pit aims to be different from its fellow competitors both in terms of culinary innovations and customer service. All the outlets serve to give the people a “wow experience” during their stay, with frequent feedback from their visitors, regular customer engagement, strict adherence to cleanliness and other global health standards, well-spoken employees who will communicate effortlessly and satisfy the curiosity of every customer, apart from of course, a whole wide range of options to choose from when it comes to the main aspect of Pita Pit, food. Mr. Dhawan emphasized on the employee background of Pita Pit as well, stressing on the undeniable fact that all their workers need to be fluent in the English language so as to cater with clientele from all areas and ethnicities of the world. 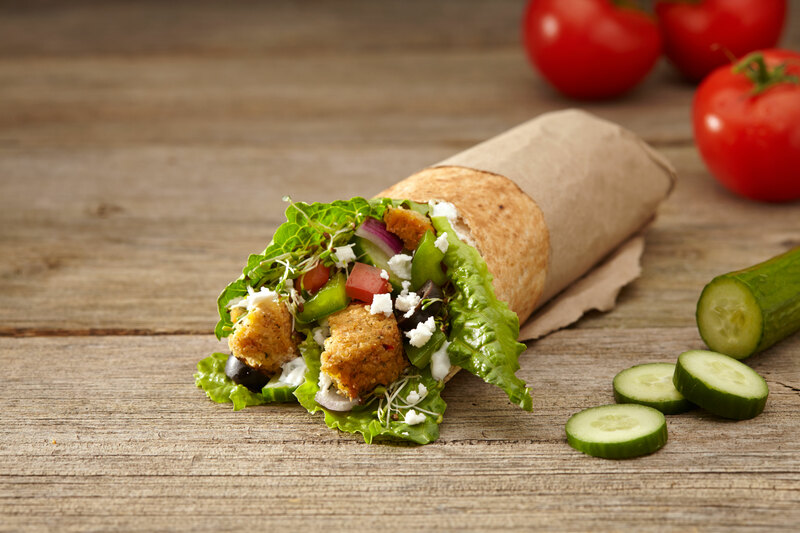 Although, while many find Pita Pit to be similar to Subway, the former has an edge in the market due to the overall healthy nature of its products. Whole wheat bread, similar to homemade roti, is used in all its preparations, which is an added bonus for frequent and health-conscious customers. Different kinds of cheeses are used, the three main being parmesan, cheddar, and feta, as well as sauces from all around the world, with a total of sixteen choices to pick from, including mayonnaise, mustard, vinaigrette, chipotle, and many others. There are different cuts of meat to choose from, and even a soyabean alternative for the conscious vegetarian. A base spreading of either tzatziki, hummus, or babaganoush is used. The salad dressing includes our everyday vegetarian fare, the standard onions, tomatoes, capsicums, mushrooms, and olives, as well as more unconventional salad alternatives such as sprouts, jalapeno, pineapple, and corn. Pita Pit thus has an unparalleled consumer range, as their varied and easily modifiable menu caters to anyone between the ages of fifteen and seventy-five years. Pita Pit also has a beverages and desserts menu in addition to the pita sandwiches it offers, and they are no less either when it comes to nutritional value. 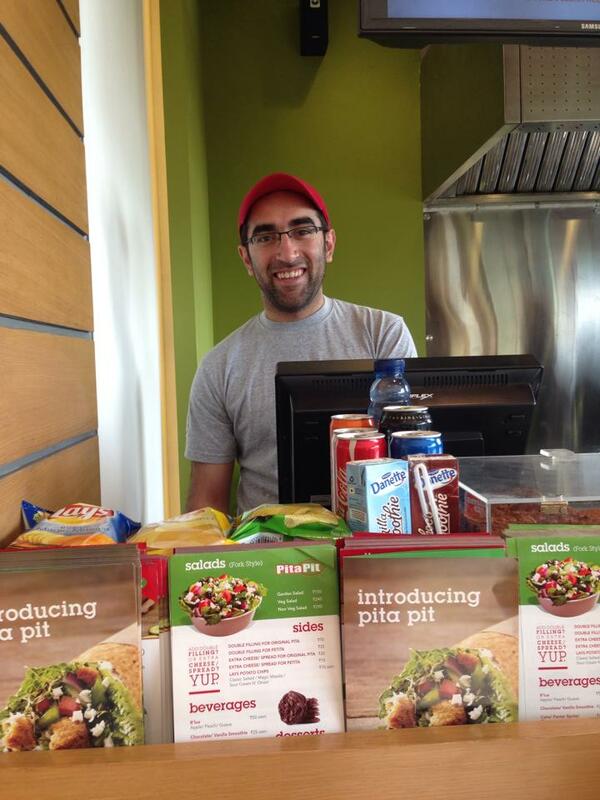 I had the privilege of getting a hands-on experience in making a pita sandwich at the Pita Pit Lounge. After wearing a disposable hairnet and plastic gloves, I entered the sleek and organized open-air kitchen. The pita bread resembles the roti in both its structure and shape, and is opened up in a transverse manner by prying the edges apart using just your thumbs. Customers have the option of having their sandwich being made long or thick, and such variants in the six inch and the nine inch types. The basic aim however, is to make the biggest sandwich as possible, and for this approximately forty percent of the bread is opened. The workstation is organized in a very smart and systematic fashion, and multiple sandwiches can be made on each counter without any hassles and confusion from either end. Everything is lined in order, the base spread, vegetables, the roasting oven, sauces, and the toasting grill. I quickly made my own chicken club sandwich, using tzatziki, a few choice vegetables toasted in cheddar, some mayonnaise and mustard, oregano seasoning, and salt and pepper. Once everything I wanted in the sandwich was placed on my pita bread, I gently pushed the filling inside of the cavity formed using my fingers, and then wrapped the rest of the bread snugly around it. I had it grilled briefly as per my tastes, and then animatedly relished my pita sandwich. The vegetables and the pita bread certainly made a different sandwich than the usual fare I am used to, and it was a nice, light change from the usual heavy and cholesterol filled versions one is used to having. I washed down my pita bread with a glass of freshly made watermelon juice, with zero artificial sweetening and preservatives, and with its natural, summertime flavours intact in entirety. I also had a cup of cold coffee along with my sandwich, which was surprisingly light but still refreshing in flavour. I also tasted a rose flavoured freshly brewed organic green tea, which forms a part of beverages exclusive only to the Pita Pit Lounge. It was served in a very interesting way, with fresh tea leaves crushed inside the transparent glass container of hot water. The flavour was quite unique and earthy, and appeals to the healthy eater. After trying the chicken crave sandwich on my second round of helpings, which had a nice, smoked taste to it, I also had a carrot bran cupcake. It was an interesting take on a much loved and popular dessert, with an unforced natural sweetness, and bits of shredded carrot adding to both the texture and the taste. I rounded my Pita Pit journey with a warm chocolate chunk cookie, which was comfortably crunchy on the outside, and had a deliciously soft brownie texture on the inside. In addition to its efficient service and amazing food, the Pita Pit Lounge is worth a visit for its chic decor and plush interiors. Using the standard company colours, the Lounge has comfortable wooden chairs as well as fluffy sofas for its visitors. The artwork is minimalist, and yet distinctly pleasing to the eye. One wall of the outlet is completely etched with names of the cities where one can find Pita Pit outlets in, and one side has aesthetically positioned book shelves and magazine racks nailed on it. With upbeat music flooding the background, people can converse easily with each other, and yet enjoy the general atmosphere. All in all, Pita Pit is worth a visit, and I highly recommend it to everyone who wants to try a healthier side of restaurant dining and all those who enjoy their traditional home made meals.